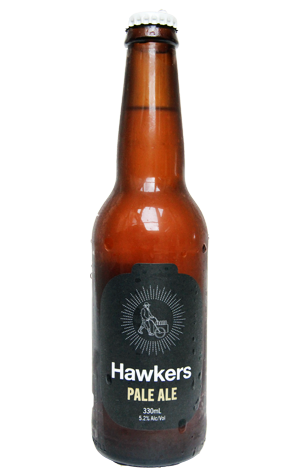 As a way to announce yourself to the world, Hawkers' first beer did a pretty good job. Released on a Thursday, voted People's Choice Best Beer at the Great Australian Beer Festival in Geelong on the Saturday. It went on to sell faster than any beer in history – by a rate of two-to-one – at local bottleshop / bar Carwyn Cellars and the first 15,000 litres was sold out within 20 days. The beer itself is an American style pale ale and one that aims for the punchy character of the APAs you'd find Stateside. The lively citrus fruit and piney aromatics fly at you out of the glass, with the trio of US hops plundered for all the juiciness they have. It's a pale pale ale, with the malts playing second fiddle but working hard enough to ensure that while the resinous bitterness is noticeable it's not going to stop you going back for more.